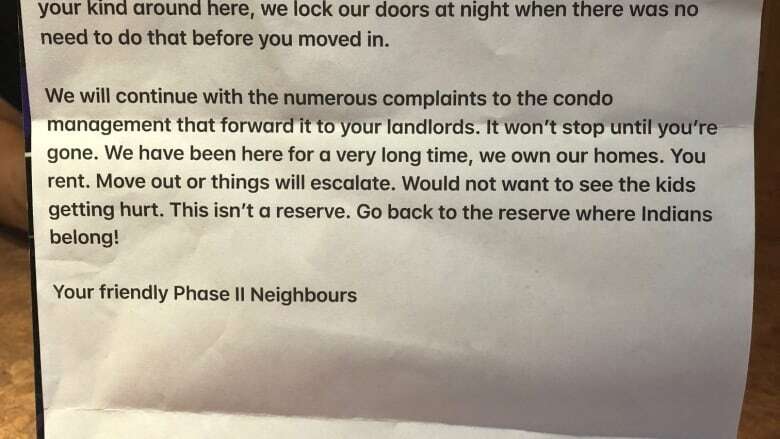 After receiving a threatening, racist letter from neighbours earlier this week, a St. Albert mother says she fears for her children's safety and will move out of her rented condo. Katrina Anderson said her 12-year-old daughter found the letter in the mailbox Monday when she returned home from school. The anonymous letter initially complained about children riding a scooter on driveways and playing basketball and football on the street. It then said, "We don't like your kind around here." The tone of the letter later became threatening and focused on the family's First Nations background. "Move out or things will escalate," the letter said. "Would not want to see the kids getting hurt. This isn't a reserve. Go back to the reserve where Indians belong." The letter was signed "Your friendly Phase II Neighbours." St. Albert RCMP confirmed a complaint was made Wednesday afternoon and said police are investigating. "I was absolutely disgusted," Anderson said. "I didn't even know what to say to [her daughter]. I've experienced racism my whole life but I've learned how to shrug it off." The family has been living in the Grandin Woods Estates for 18 months. Anderson said they have heard complaints about scooter riding on driveways through the condo manager, but said her children respected those complaints. 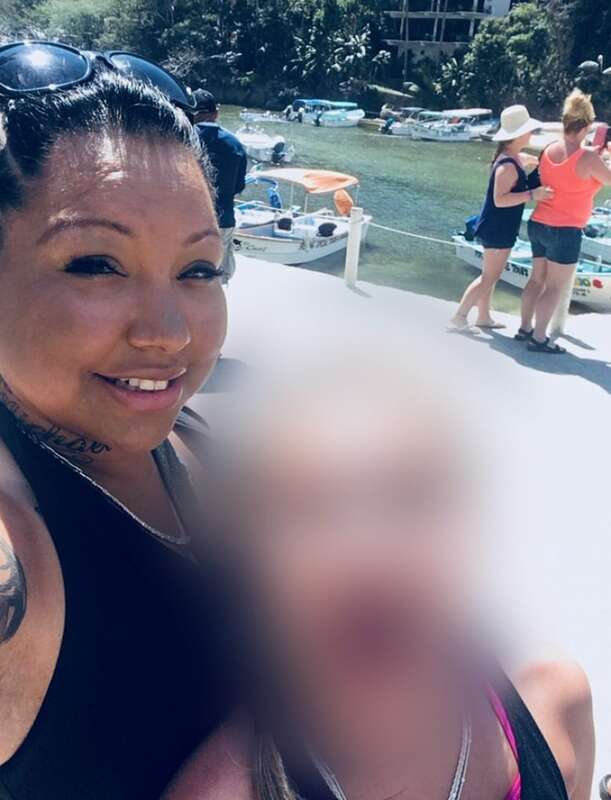 She and her husband have decided to move to another neighbourhood in St. Albert, Anderson said, out of concerns for their family's safety. "My daughter, my kids, don't feel safe here," she said. "They don't want to play outside. I've been driving my kids to and from school. They don't feel safe. They don't even feel safe walking to the corner to catch the bus anymore." A member of the Pasqua First Nation in Saskatchewan, Anderson said she has lived in St. Albert for 27 years. She said it was particularly disturbing that the incident happened in her hometown. "I want to make people aware that this is still happening," Anderson said. "I want reassurance for my children. I want them to feel safe and know that there are good people out there and not everybody is like this." Anderson said the letter has made her suspicious about an incident from last month. On Sept. 15, a rock was thrown through the condo window, but she said they focused on getting it fixed and didn't report it to RCMP. "We thought it was just random kids, or whatever, because there was a rock thrown," Anderson said. "We didn't report it because we couldn't prove who it was. We don't have surveillance set up. We didn't think anything of it, until now." She received a message Wednesday from St. Albert Mayor Cathy Heron, who expressed her disgust with the letter. "I just needed her to know from a person in my position that I am saddened by it and I'm aware of it," Heron told CBC News. The city has offered the family help through the community support development department, the mayor said. Anderson said the Grandin community has reached out to her and plans to hold a block party in response to the incident. If that happens, she said she and her family will attend.